There can be no doubt that there is a need for a credible and high quality biography of JOAN JETT. Unfortunately, this is not it. Thats not to say this is poor, it just lacks any in-depth analysis of JETT the person as opposed to a general overview of her career. The disheartening feelings begin with the very first words of Chapter One - Kim Fowley. While he undoubtedly played a massive part in JETTs life and especially when it comes to THE RUNAWAYS, the text gives us more details about his past than JETTs own early years. Indeed, there are only cursory details about JETTs upbringing. From there we get a basic telling of JETT and her life in music. THE RUNAWAYS obviously get virtually the first half of the book given over to them. Other notable parts involve the recording of the classic GERMS album, JETTs affiliation with the Riot Grrrl movement and her brief involvement with THE GITS. THE BLACKHEARTS obviously take up another large proportion of the text also, but much of the most satisfying reading for me involved her lesser known endeavours on the acting stage. Thompsons narrative presents the facts in a no-nonsense, easy to read manner. He occasionally slips into fawning hyperbole territory as is the case for many unauthorized biographies, but he doesnt resort to sounding like an advert for the books subject figure. He has clearly done his research also, garnering a lot of quotes from a myriad of people. A bit of fine-tuning would have been appreciated as there are numerous small, irritating errors - Kiss apparently had a song called Stutter instead of Strutter; the UK Punk band that supported the RUNAWAYS at the Roundhouse was SUBURBAN STUD singular instead of plural; John Doe was the guitarist in X and, most amusingly, the claim that by October 1977, THE CLASH was "as established as a theatre group as any pre-Punk dinosaur" - this a mere month after the release of the Complete Control 7". These errors may only be minor, but they do make me question how many others may litter the text and suggest a rather slap-dash approach by Thompson himself. The book is rounded out by a photo segment and a detailed discography. This book does highlight the negative about unauthorized biographies. Without any new or personal input from JETT, it does render Thompsons task of connecting the reader to JETT as a person incredibly awkward. His text keeps JETT at arms-length and, even when discussing her sexuality, the reader still feels disconnected from her with the exception of her guise as a Rock n Roll star and actor. Ultimately, the book lacks intimacy. It could be very easy to misinterpret this if you judged the book purely on its cover. At first glance, this appears to be more about tattooing than Punk Rock. 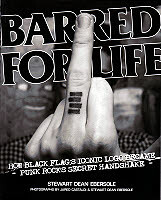 There are lots of photos of people with tattoos, both heavily and lightly inked, of BLACK FLAGs iconic bar logo. I dont have a single tattoo and I plan on keeping my skin clear of ink, but if I did, I would not personally choose the bars. The actual scope of the book, however, transcends mere tattoos. The book is basically a visual document of a tour Ebersole undertook in 2009 looking for those with the BLACK FLAG bars tattooed somewhere on their torso. The book captures approximately 400 of those FLAG fans in sharp monochrome photography in all manner of settings. Each fan gets their own little spiel about what BLACK FLAG mean to them (with some being poignant in the extreme), favourite track, album and singer. Its an interesting way to spend a spare five minutes and there are no clear-cut choices when it comes to singer/track/album preferences - even The Process Of Weeding Out gets a few votes! Those featured include a few notable names too - Frank Turner is on the final page, owners of Equal Vision, Slang and Deathwish Records appear, Tripp Underwood of UNSEEN and Erik Larsen (ex-AVAIL) also make appearances. However, its the narrative of Ebersole that I found engrossing. Its basically his own life story in Punk Rock. I always enjoy these stories and Ebersole writes with clarity and passion and without any sense of egotism or superiority. Its a familiar rite of passage that many of us took - especially those who are still moved by this Punk Rock thing some 30 years later - but as with all tellers of such stories, its the small differences that make the bigger picture that much more interesting and unique. He tells of his sense of feeling an outsider, of how a few people directed him toward eye-opening and life changing events and sounds and of his eventual disillusionment. Whats clear is he does still love Punk Rock and the way he winds the history of BLACK FLAG (fact and fable) into the narrative probably makes this the most enjoyable book about BLACK FLAG out there. Interestingly also, Ebersole is quick to point out that BLACK FLAG was probably never his most favoured Punk band. Giving this a sense of official authorisation, Ebersole has also interviewed BLACK FLAG alumni Keith Morris, Chuck Dukowski, Dez Cadena, Ron Reyes and Kira Roessler. Not stopping there, photographers Ed Colver and Glen E Friedman are included in conversation, as is tattooist Rick Spellman who is responsible for Rollins back. The interviews are really great too - particularly Dukowskis. Ebersole states that both Greg Ginn and Henry Rollins were offered interviews and both declined; thats probably more detrimental to Ginn and Rollins than the book itself. The interviews look great too, being printed on four huge bars across double pages.